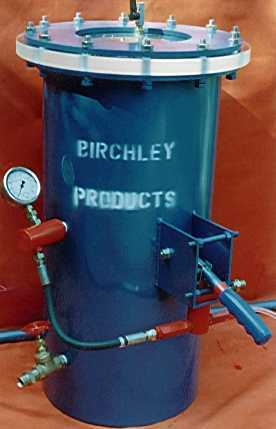 The test tank is designed to pressure test any items of equipment, to ensure pressure integrity, strength and watertightness. The unit is constructed of steel plate rolled and welded, with a flange mounted "O" ring seal and a 1" thick Perspex viewing lid. Testing medium is water, and the unit is supplied with water in and out valves, air bleed, gauge, hand pump and pipework. The basic dimensions of the unit are 10" I/.Dia x 24" deep, but these dimensions may be varied to suit customer requirements. Maximum pressure is 150 p.s.i.